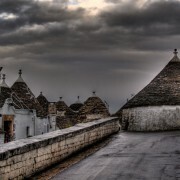 Puglia, This is a region which is accompanied by the sea; its country is mainly flat, lacking in surface waters, but its roots are soaked and rich of the so – called carstic phenomenon. A scenery surrounded by calcareous rock, red soil, secular trees, dried-up beds of ancient streams, and a vast cultivated landscape. Apulia or “Le Puglie”, indicating its traditional definition, takes the memory back to those multiple microcosms in which its complex identity, remarkably, dissolves. 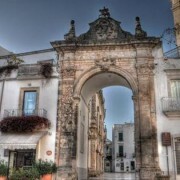 The first time in Apulia may turn out to be a sort of personal challenge for many; several well – known travellers of the past have been struck by its uniqueness, and, simultaneously, disoriented and almost irritated, due to the impossibility of being able to seize it completely, as an open book. More than one traveller (either well-known or not) has either decided to stay for good or return to that land, people, history, art, which had previously struck him/her. Furthermore, it is also that adventurous feeling of finding oneself on the borderline between two worlds, placing one foot in Europe and the other in the Eastern hemisphere that becomes a one in a lifetime experience, allowing the foreigner to both glance at the future and keep a well–knitted bond with the past. It is a mosaic, made up of sand and rock, a luxuriant mountain of thick vegetation and fields of wheat, fruit, olives all over, rocky hills, still lagoons and underground cavities, marked, moulded and modified by man, who has, over the centuries, made a land, which would have, otherwise, been doomed to a perpetual thirst, fertile and opulent – without leaving empty spaces – erecting dolmen and menhir, castles and cathedrals, abbeys and sanctuaries, museums and buildings, mansions and manor farms, towers and trulli (typical cone-shaped homes). 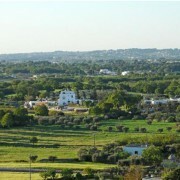 The Valle d’Itria is the heart of the white wines of Apulia. 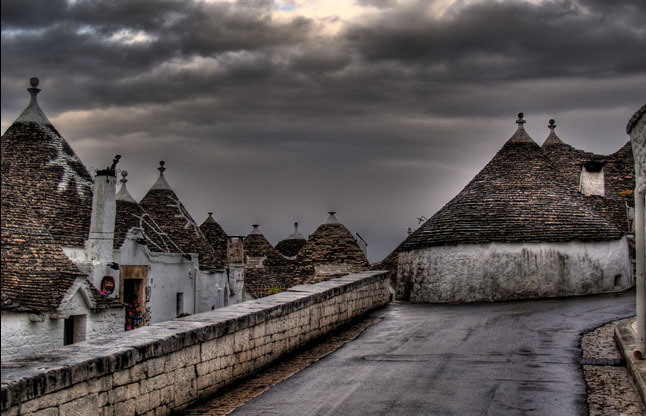 The natural environment is marked by the domes of the trulli (typical cone-shaped homes), which can be admired from the balconies of the fascinating districts of Locorotondo, Martina Franca and Cisternino. 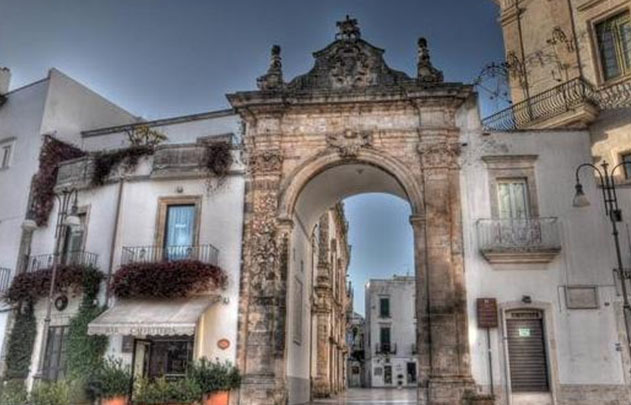 A few kilometres away from these towns, white Ostuni, with its terraced fruit and vegetable gardens, surrounding the town walls, a thick system of manor farms and historical castles and a precious fully reborn ampelographic patrimony, thanks to the recovery of rare native aspects, such as the Impigno and Ottavianello wines. The Susumaniello, a blackberry variety of wine, of Dalmatian origin, also made in purity, deserves special attention. From the vine rows of bianco d’Alessano and Verdeca, delicious and famous wines are obtained. Messapia, a historically and culturally rich territory, is the land of the Primitivo, which is a very old native wine variety, the grapes of which reach maturation in late August (where the name comes from), giving life to a full-bodied red wine, carrying particular characteristics and a fairly strong alcoholic level. Fields of secular olive trees, vast cultivations of figs, and wide vineyards make up the territory embraced by Manduria, Sava and Lizzano, caressed by the breeze of the Ionic sea, where the picturesque vineyards of the Primitivo, some up to 80 years old, find the ideal microclimate to best express themselves, handing the famous Doc Primitivo of Manduria its name. 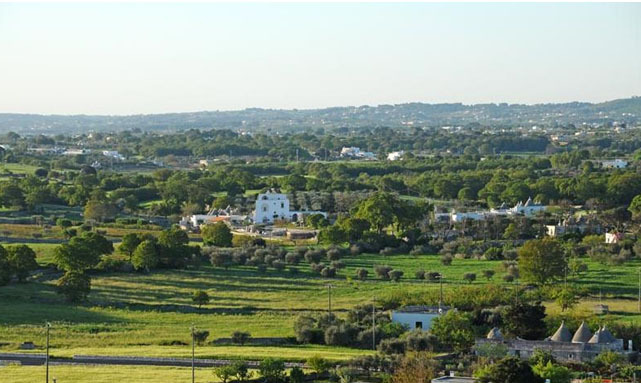 Martina Franca, located at 431 m. height above sea level, situated on one of the last southern hills of the Murgia south-east, overlooking the lovely Martina Franca Itria Valley, a beautiful expanse of green white trulli. The main attraction of the city is undoubtedly formed from the quaint old town, a splendid example of Baroque art, which, with its narrow streets, its white lanes, stately and majestic and monumental churches. In addition to a rich landscape dotted with ancient “casedde”, the famous Trulli, and the typical local farms, valuable evidence, Martina Franca is surrounded by a Karst territory suggestive caves. From its strategic location, the Ionian city offers to its visitors a striking view over the surrounding areas, beyond which lies the province of Brindisi and Bari, and beyond, the Adriatic Sea.